Where Ancient Temples meet Byzantine Churches. 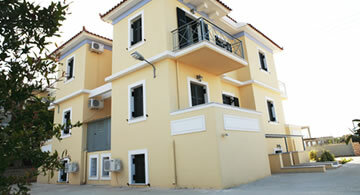 Day Rent Apartment in the town of Aegina Island. Our newly build apartment complex has fully equipped rooms and can accommodate 2 or 3 individuals. Karmela Studios is located in the town of Aegina just 10' walk distance from the main port of the island. You can relax and enjoy the summer breeze of the island, the night sky, your morning coffee even get some tan before the beach in one of the two balconies that every room has. Karmela Day Rent Apartment can offer a free parking space inside the complex for your car or motorbike. 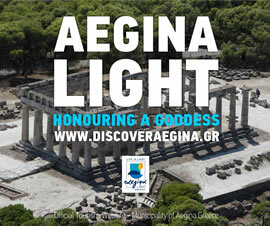 Also we can book a vehicle for you in a special price from Drive Rentals Aegina. 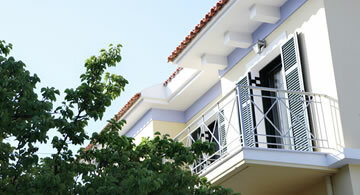 Karmela day rent apartments and studios complex is located in the town of Aegina 10' from the port. All apartments and studios are fully furnished featuring equipped kitchen with refrigerator, coffee maker, air condition and central heating providing the possibility to stay during the winter months. Also offers in room services like TV and WiFi internet access and a parking space for each apartment within the complex. With the excellent services we can provide, such as daily maid service , car rental, arrival transportation service from the port, 24-hour operation of the parking area for your car or motorcycle, we aim to contribute even more to make you staying in Aegina more comfortable and relaxing. Contact us for room availability, prices by season and special offers. There are places that enchant a visitor like the Sirens enchanted Odysseus. Aegina is such a place, which is why so many wanderers end up staying on this little island in the Saronic Gulf for years or even for their entire lives. Painters and iconographers, sculptors, musicians and writers, many of them among the greatest names of Modern Greek civilisation, have been a part of the singular character of this community for decades now.